When you’ve finished developing your app, it’s time to share it with your users so they can try it out and make sure everything works before launch day arrives. To get the best results, users should test the app in real-world conditions, where they’re most likely to find bugs or features that need improvement. And if you provide clear instructions to your testers, you’ll get more consistent and reliable feedback. 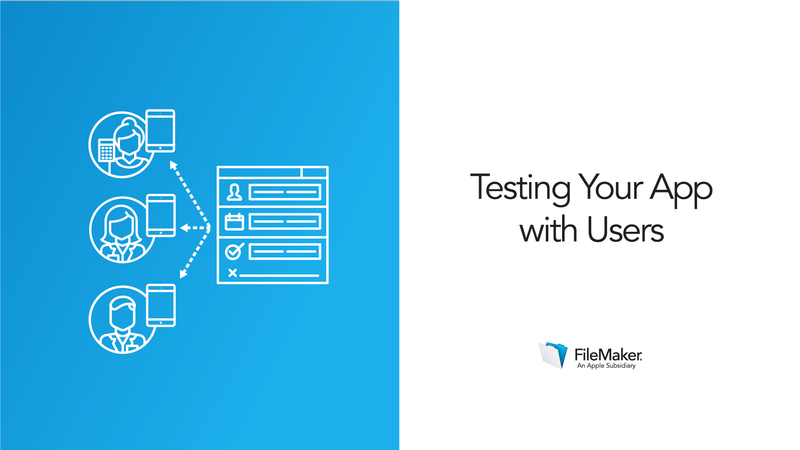 Your app needs to be usable — that is, it should help users do their work quickly and accurately. Get feedback from your users about whether the app meets their needs and how it could be improved. The first video in this lesson will give you guidance on a process for eliciting user feedback on your app. For testing purposes, you can simply host your app for a small group of testers (up to five) on a desktop computer that’s connected to your local area network. It’s natural for business needs to change over time, so you’ll continue to get feedback and new requests for your app on an ongoing basis. This is good news — when you get feedback on your app, it means users are engaged with it! Continue in these cycles of gathering feedback, organizing requests, and making improvements, and your app will grow with your business. The best app in the world isn’t useful unless its users find it to be. If you missed something while creating the app, testers will point that out so you can add or amend features before launching the app. Follow the model below to guide your users in their tests.